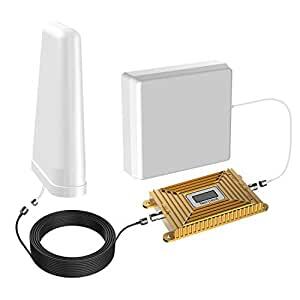 Compatible with US Carriers: Signal Booster is compatible with all US carriers including AT&T, T-Mobile, Verizon, smart chip, high-tech custom circuit, better voice quality, fewer dropped calls. Coverage: Maximum coverage range 3000 Square Foot Area, Over 1-2 Rooms of a Home or Small Office. Can be used for home, hotel, office, basement of buildings, coffee shop and shopping mall etc. Frequency: 700MHz, faster uploads and downloads, stop dropping calls any more better voice quality. It can enhance 70dB cell phone signals,so you can enjoy clearer, faster. Easy Installation: Its feature quick and easy, do it yourself installation. All components needed for installation are included, making for a seamless set up of your signal booster.